You are here: Home / Uncategorized / Client of the Week / Client of the Week Sheila Lost 9.5 and You Can, Too!! Client of the Week Sheila Lost 9.5 and You Can, Too!! Lost 9.5 Lbs in 1 Week! Congratulations Sheila, who lost an amazing 9.5 lbs in 1 week! Sheila has continued to not only lose the weight, but also increase her fitness level, and improve her endurance. To date, she has lost a total of 18 lbs in fat, and lost 6.4% in body fat. 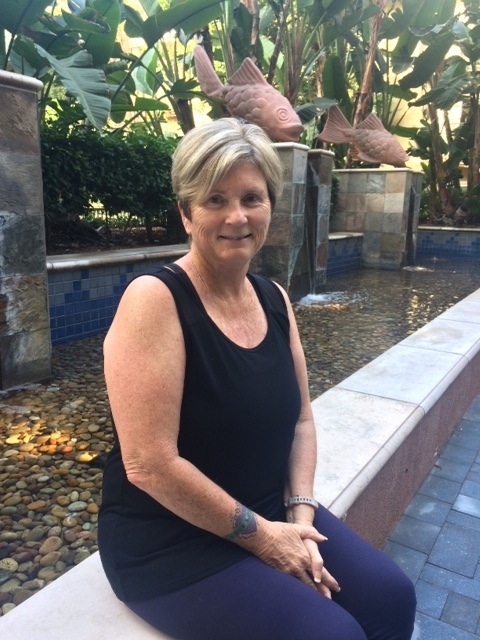 Sheila lives in Redlands, California, and has been truly blessed to be supported by so many in her life, surrounded by family and friends. Now retired, she had a successful and fulfilling career as an elementary school teacher. One part of her life was not always so constant, her fluctuating weight gain and losses. At times this left her feeling ashamed and embarrassed. In recent years living alone proves to be the hardest challenge for Sheila. Although always welcomed at her son and families home, when alone she would always put off today what could be done tomorrow. Six weeks into retirement, Sheila decided that something needed to change and she needed help to do this. She researched and came across Live In Fitness, and it was everything she was looking for! When asked, what did you expect when coming here to LIFE? “My time here has surpassed any ideas or dreams I had coming here. The staff is qualified in not only coaching me to become stronger physically, but there’s a mindset of encouragement and also an expectation of personal responsibility. I am thrilled with my progress so far in the program. I am stronger physically and mentally. My endurance and mobility is constantly improving. Most importantly, I have experienced pushing myself physically in ways I never have before and along the way discovered ‘Jumping Jacks’, I love jumping jacks. I could do them all day long. The food is healthy and amazing, cooked fresh daily with lots of variety. During my time here at Live In Fitness I have come to learn and understand that my issues about weight are really about being healthy, making good choices, breaking bad habits, and learning new ways to think and do things. Sheila’s advice to any newcomer attending the program would be to simply follow the advice of the professional LIF Team and follow the program. Attend the sessions and lectures, and be prepared to do the homework. Go the extra mile. Be positive with an open mind, ready to listen and learn. This program will enrich your life for the better. We are all worth it! Sheila, you are like the ‘little engine that could’ and there is no stopping you. Such a pleasure to work with and an inspiration to many. Congratulations from the entire LIF Team! https://www.liveinfitness.com/wp-content/uploads/2018/10/IMG_8700-e1539036555691.jpg 339 480 themepunch https://www.liveinfitness.com/wp-content/uploads/2018/08/unnamed.png themepunch2018-10-08 15:09:372018-10-08 15:09:37Client of the Week Sheila Lost 9.5 and You Can, Too!! Client of the Week Laine! “Put yourself first, so you can be a better... Client of the Week! Congratulations Kim! !